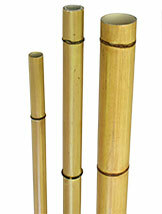 Our synthetic bamboo poles are virtually indistinguishable from real poles. They are made of PVC and are banded and shaded just like the real thing. The height can range from 2 ft. to 25 ft. and the thickness from ½" to 3" diameter. Convenient modular assembly reduces freight costs and makes for easy installations. 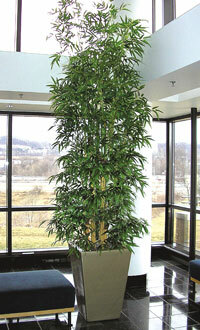 For more information on these guaranteed beautiful trees call 1-888-745-5701. 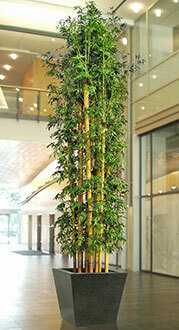 Mall Silks’ synthetic bamboo poles won’t split like real ones do, and the appearance is identical. They are vailable in green or brown tone, or custom stained to your liking, no two pieces are alike. The nodes are varied so that a repetitive pattern is never created on the poles. Water won't hurt them, and they are fire retarded. Our exclusive stable weighted bases are designed to work with your needs. 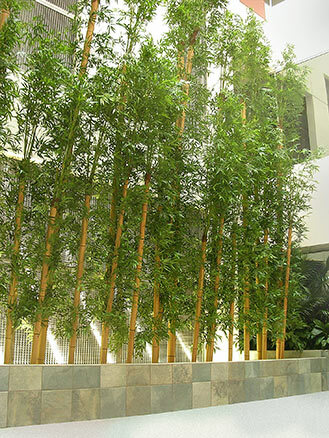 Each bamboo pole is inserted into a PVC tube surrounded by heavy concrete, or into metal pipes or on metal rods on a heavy steel base plate. This can then be placed into a planter or decorative container and you can be sure that it won't move. Cover with foam pellets, then moss, mulch, stones or underplanting to complete. 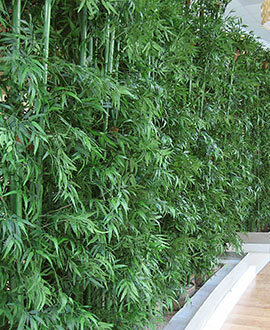 Click here for basic synthetic bamboo info. 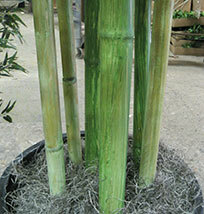 Click here to see bamboo on NATURAL canes. To order call 1-888-SILKS-01 or E-MAIL US.